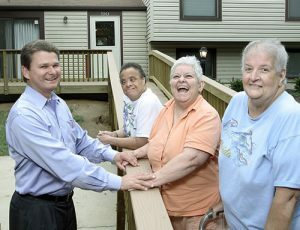 When The Arc’s home on Graeloch Road in North Laurel needed major renovations, it was DreamBuilders of Maryland that transformed the aging rancher into a more comfortable, accessible home for its three disabled residents. The teen and adult volunteers from St. John’s Episcopal Church in Ellicott City, St. Mark’s Episcopal Church in Highland, The Church of the Ascension in Westminster, Temple Isaiah in Fulton and Trinity Episcopal Church in Elkridge worked every weekend for three months to create a new interior floor plan with wider doors and hallways, two accessible bathrooms and a larger, barrier-free kitchen. They also built a 672-square-foot addition and replaced the deteriorating trusses and roof. The remodeled home was awarded a Energy Star Program Home Energy Rating System score of 53. The Graeloch Road house wasn’t the first project DreamBuilders did for The Arc. The two groups formed a partnership in 2006, and since then DreamBuilders has remodeled 10 homes for The Arc. The organization won The Arc President’s Award in 2009.